With all the sound and fury over L.A. Live signs and the multi-story supergraphics going up around the city, it’s easy to forget that anti-billboard sentiment really took off with the abrupt appearance two years ago of the first digital billboards. But these brightly-lighted signs that have generated numerous complaints of light pollution and raised questions about excessive energy use and traffic safety will be back in the spotlight this coming Friday, when an L.A. County Superior Court judge will consider arguments seeking to nullify the city’s 2006 lawsuit settlement that allowed them. Additionally, the city’s Zoning Administrator is expected to issue a ruling shortly on the legality of permits issued for three digital billboard conversions in the Westwood area. Those permits were challenged earlier this year by two homeowner’s groups and the Coalition to Ban Billboard Blight on the grounds that the conversions were illegally exempted from local zoning regulations, public hearings, and environmental review. The Superior Court case, Summit Media vs. City of Los Angeles, was filed last year by one of the city’s smaller billboard companies, seeking to void the lawsuit settlement that allows industry giants Clear Channel and CBS Outdoor to convert 840 of their billboards to digital. The suit claims that the settlement violates the constitutional rights of Summit Media and other companies that cannot legally convert their billboards. It also argues that the settlement unanimously approved by the City Council should be declared illegal because it allows Clear Channel and CBS to circumvent the city’s zoning regulations and the well-established right of the public to be heard on land-use decisions. 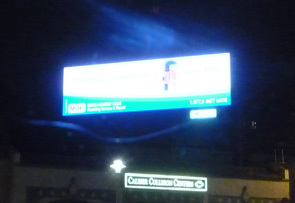 The 2006 settlement was the culmination of a lawsuit filed by Clear Channel and CBS Outdoor in 2002 challenging an ordinance calling for a periodic inventory and inspection of all billboards and other off-site signs in the city. In a twist with a liberal dose of irony, those two companies have now entered the Summit Media case in the city’s defense of the settlement that provoked public outrage and resulted in the erection of just over 100 digital billboards prior to the enactment of a moratorium in December of last year. In another twist, a man named Alex Kouba is identified in lawsuit filings as a “managing member” of Summit Media, which has an office address in Santa Monica. An online document identifies “Alex Kouba” as head of Liberty Media, the sign company that most recently lost a federal court challenge to the off-site sign ban adopted by the City Council in August of this year. That company’s listed address is a mailbox rental facility on San Vicente Blvd.